Planning a wedding can and should be a lot of fun. It consists of many necessary yet sometimes taxing tasks. A seating chart can be one of those tasks. Besides the obvious, you want your guests to be comfortable, enjoy the company of other guests at their table and have a memorable time at this very special event, your wedding celebration. By sitting your guests at specific tables you can put groups of family or friends together, place out-of-town guests with others to ensure them an enjoyable time, or seat guests together that have things in common. Assigned seating takes out having your guests search for a table with an empty seat or two, and makes them feel more welcome. We offer software packages to simplify this task of creating your seating arrangements resulting in an elegant seating chart display for your reception! The process is completed by entering your guests’ names, click ‘n drag their placement in a virtual table setting, making any customizing selections and you’re almost finished! With a click of a button your seating information will be uploaded via the internet and within a few days your personalized seating chart arrives, just as you ordered it! It is so easy to use. The software also allows for keeping track of RSVPs. Scalligraphy Seating Charts Available in 2 Convenient Sizes! This FREE Scalligraphy software, sent as a download, will allow you to have a customized chart with choice of design format, font colors, enhancements, paper choices and finishing options such as foam core mounting or framing. There is an additional charge for some of these add-ons. With many design and option possibilities, your seating chart will truly be a one-of-a-kind work of art. Super-fast 5-business day turnaround from submission to your door is included. The software for this product is available as a download by contacting us. 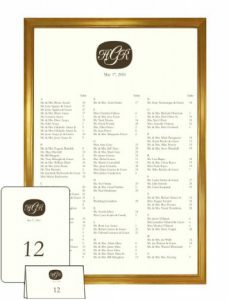 Matching table number cards, menus, place cards and programs are also available. 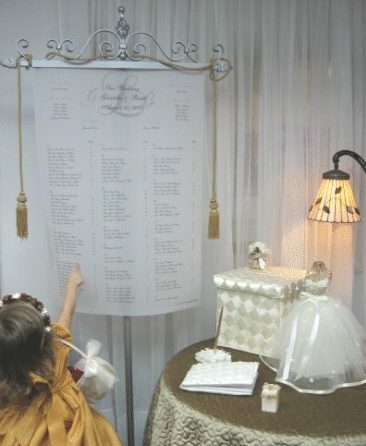 Our CLASSIC seating chart is available on both white and ecru premium parchment-style papers. You may include the option of adding a picture in the background for more personalization. A white fabric paper is used to enhance the images. This FREE CLASSIC seating chart software will provide you with a beautiful and elegant 24″x36″ seating chart and holds a maximum of about 300 guests. The use of our silver stand is provided FREE of charge to our Michigan couples. Pick it up just before your wedding, and return it afterwords. You will want to reserve your stand EARLY, as they are limited! We are a Premier Authorized Bumjenga Dealer! Order your Seating Chart today!